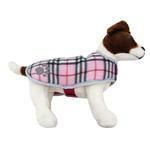 Keep your pets cozy and warm this winter with the Zack and Zoey Nor’easter Dog Blanket Coat in Pink! 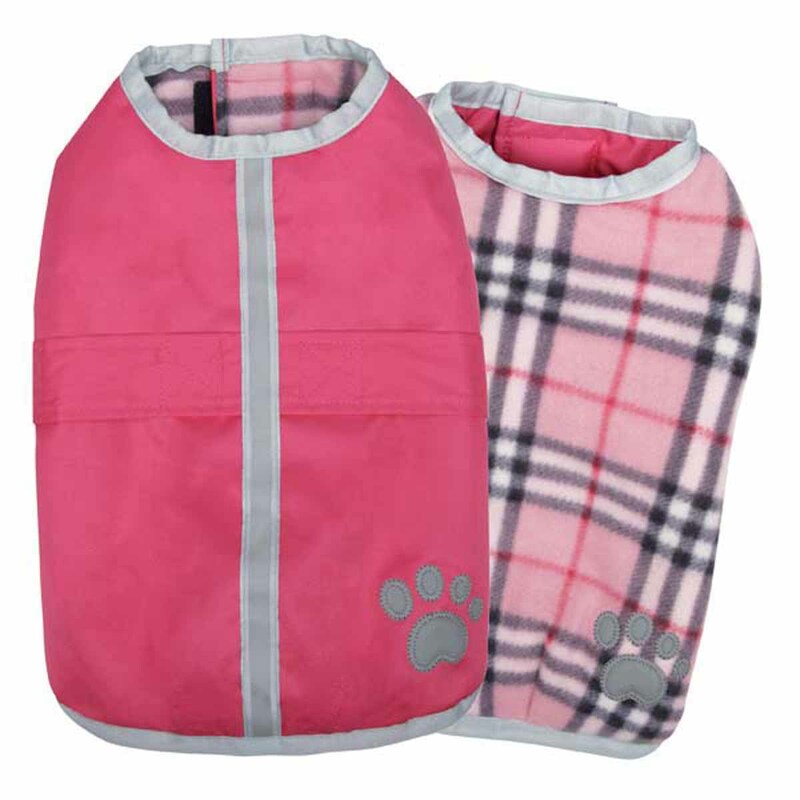 Help pets take a bite out of nasty weather with Zack and Zoey® Nor’easter Blanket Dog Coat in Pink. Each jacket features a reversible waterproof shell, a soft plaid fleece lining and a reflective stripe and paw print detailing. This coat also features a nice amount of polyester insulation between the fleece and the waterproof shell for a complete barrier against the cold. This cozy coat is a simple but effective blanket design that is easy to apply. Simply select the side you want to show and lay the coat over your pet's back. Next, adjust and secure the touch fastener to fit your pet at the neck and then the chest. Now your dog is ready to take on the elements! We love this bright pink color and cheery plaid. It's a great way to banish the cold-weather blues! Should your dog's coat require laundering, machine wash it in cold water on a gentle cycle. Line dry. On this particular coat, the back length is most important. However, if your dog has a stout build or a broad chest, take that into consideration and select one size larger. To obtain your pet's back measurement, measure length of pet's back from the base of the neck to the base of the tail. Posted On 02/09/18 by Patricia S from Baltimore, MD Yes, Patricia S recommends this product! Posted On 10/02/17 by LORRAINE K from Lansdale, PA Yes, LORRAINE K recommends this product! Loved the color & the style. When we get our puppy I know she will be warm! Posted On 04/08/17 by RIta I from Chalfont , PA Yes, RIta I recommends this product! Sweet blanket coat hot pink on one side light pink plaid on the other Xs fits my 4 lb yorkie. This should be worn with a sweater under it. Easy to put on and take off for a quick trip outside. Posted On 03/02/17 by Deni S from New York, NY Yes, Deni S recommends this product! Posted On 01/29/17 by Sandi K from Aptos, CA Yes, Sandi K recommends this product! I ordered this in a medium according to the sizing guidelines. It was too big so I sent it back. It was really cute though and the lining seemed warm. Posted On 01/13/17 by Carol S from Knoxville, TN Yes, Carol S recommends this product! I love these coats not only for their looks, but because they are reversible and truly work in all kinds of weather (except hot!). One of my dogs has arthritis in his shoulders so putting a pullover on him is impossible - it causes him too much pain and distress. This is the perfect option because it fastens around the neck and then under the belly. Posted On 01/10/17 by Kristin L from , NY Yes, Kristin L recommends this product! This is the second Nor'Easter coat I purchased for my pup. The fleece keeps her nice & warm on the cold winter days. I did have to modify the XL and add more velcro to the neck due to her deep chest (the size large was perfect everywhere except the belly strap & it was easier for me to add velcro at the neck than extend the belly strap). If it wasn't for that I would have given this 5 stars! Posted On 01/07/17 by Michele N from Egg Harbor City, NJ Yes, Michele N recommends this product! I love the plaid side and REBA MCINTYRE NAUSE loves the plaid side. She acts "proud" while wearing it. Posted On 01/07/17 by Carol D from Beverly, MA Yes, Carol D recommends this product! This is so darn cute yet practical. I love it.....Tiffany Grace loves it. It's a huge hit at a good price! Posted On 01/07/17 by mv57 from Butler, PA Yes, mv57 recommends this product! The pink is my favorite, but all the colors...I also have gray, orange, and purple....are beautiful. These coats are big and warm! Posted On 12/20/16 by Tina C from Loveland, CO Yes, Tina C recommends this product! Posted On 12/19/16 by Susan P from , MA Yes, Susan P recommends this product! Posted On 12/12/16 by Kristin from , NY Yes, Kristin recommends this product! This is the second Nor'Easter coat I purchased for my pup. The fleece keeps her nice & warm on the cold winter days. I did have to modify and add more velcro to the neck due to her deep chest (the size large was perfect everywhere except the belly strap & it was easier for me to add velcro at the neck than extend the belly strap). If it wasn't for that I would have given this 5 stars! Posted On 12/12/16 by Christina P from Lakewood , CO Yes, Christina P recommends this product! Posted On 12/12/16 by Crzgr8dnl8y from Magnolia , TX Yes, Crzgr8dnl8y recommends this product! I bought this coat in pink and in red, both XL. They fit my 125lb Great Dane perfectly and my 111lb Great Dane with a little room. My girls will only be wearing these on walks or on outings. I'm not sure, if they would hold up to their rough play. I'm very happy with these coats and the great price! Posted On 11/29/16 by Chris O from Hammond, LA Yes, Chris O recommends this product! I loved the Nor'easter Coats so much that I immediately ordered 6 more. The x-small fit the skinny and fat Yorkies. The small fit my miniature poodle. The medium fit the beagle. Looks awesome, easy to put on and take off, well made. Fast delivery. Love that BaxterBoo. Posted On 11/17/16 by Ellen C from , CO Yes, Ellen C recommends this product! Imagine having a BIG poodle who needs a BIG winter coat! This is a well made and coat large enough to fit her when we really get some cold, snowy weather in Colorado. Posted On 11/04/16 by Cindy from Kent, WA Yes, Cindy recommends this product! Posted On 02/08/16 by Darcy R from Ramsey, MN Yes, Darcy R recommends this product! This jacket is perfect for cold weather (live in MN). Keeps my dog warm for our brisk walks every morning. Posted On 01/21/16 by Janet S from Brookline, MA Yes, Janet S recommends this product! Easy to put on a fearful or squirmy dog. 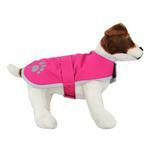 Keeps your dog dry and warm in bad weather! Pretty colors. I ordered a size slightly larger as it comes in Small/ medium that comfortably fits my little dog. Posted On 12/27/15 by pat p from idaho falls, ID Yes, pat p recommends this product! I absolutely love this coat. Easy on and off and love the color. Perfect fit for my little miniature poodle Lola. Posted On 11/28/15 by Debra R from Holly, MI Yes, Debra R recommends this product! I have ordered several times from your company and have always been satisfied and pleased.